We insist on the highest quality for our fitness supplements. We work alongside food chemists, nutrition experts and athletes to develop sports nutrition that will take you to the next level. 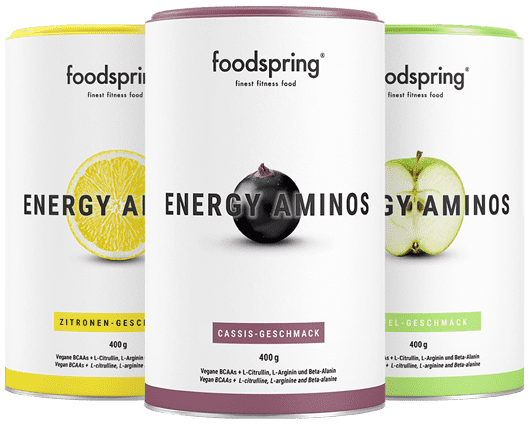 All fitness supplements by foodspring are subject to strictest quality checks. Our capsules consist of plant-based cellulose rather than animal gelatine. All of our amino acids are produced in Germany in accordance with strictest guidelines and quality standards. We use plant sources as the base, instead of the more frequently used duck feathers. Amino acids ensure even more success from your training. BCAAs are particularly important for protecting your muscles during more demanding sessions, while L-arginine gives you that extra push before the regenerative L-glutamine gets to work. Our creatine made of 100% pure creatine monohydrate will also be the perfect partner for you during extreme build-up phases and more intense workouts. The harder you work, the more nutrients you need. Omega-3 supports your vision, heart and brain functions. It is especially important for athletes to receive the right amount of omega-3 fatty acids. Aside from Omega-3, there is also sufficient supply of zinc and magnesium as well as vitamins, all of which are essential for peak performance when you need it. We developed Daily Vitamins made of fruit and vegetables from sustainable community farms to get you your full dose of vitamins. If your beach body still needs a little work, then our Shape Caps, Choline-inositol and L-carnitine can help you out.